I’m a devoted follower of Jesus Christ that desperately desires to be used by Him to make a difference in this world we live in. Large or small makes little difference to me as long as it’s His will, then I am willing. I’m also a mother of four children, currently eight dogs, one cat, and now three foster kittens. I say “currently” regarding the dogs since I’ve been known to take in a foster dog (or cat/kittens) or two at times. Of course, that’s how we came to be the “parents” of eight dogs (6 Great Danes, 1 Aussie, and 1 Border Collie mix), one cat, and 3 foster kittens in the first place. In addition to being a follower of Christ, a mother to four children and all the furries too, I am also a small business owner. 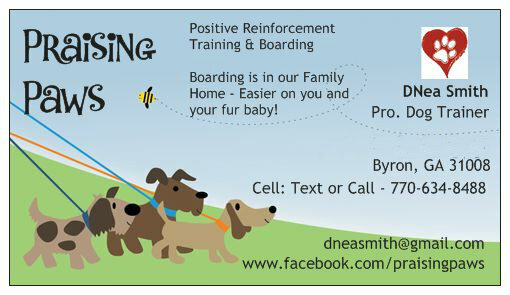 I own Praising Paws which is a dog boarding, and dog training business here in middle GA. We love having your furry babies here at our house while you’re away on vacation or away for business! So, that’s me and that’s what I do for “work” -at least part of the time. I’ve also been a photographer and candle maker /store owner. I like different; a little different anyway. As of June 2013, I added “student” to the mix! I’m now attending Luther Rice University /Seminary!!!! God willing, I plan to get my BA in Religious Arts with a major in Biblical Studies and a minor in Biblical Counseling and afterward work towards getting a Masters in Biblical/Professional Counseling. Things have changed a little since my last update on this page three years ago. I have just switched over to Liberty University for the coming spring semester in order to get a Bachelor of Science in Psychology degree with a focus on Criminal Psychology and after that will continue on to get my Master’s in Biblical / Professional Counseling at Liberty U. I decided to change on over to Liberty and get a different degree as I have begun, in the last year, doing the very thing that actually started me on the road to getting my degree to begin with – fighting child trafficking! I’m currently working with The Center for Search & Investigation of Missing Children (CFSI) as a volunteer. The entire organization is run by volunteers, actually. We help parents of missing children to find them and bring them home safely, therefore keeping them out of the hands of the traffickers. Traffickers look for missing kids on the streets… they know exactly what to look for and can spot them easily. One in three kids who are on the street for whatever reason are picked up by traffickers in the first 48 hours. It’s imperative that we find them first! If you would like to do something that gives you a sense of real meaning in life… if you’d like to help fight child trafficking…. please consider volunteering with us. We would love to have you! No experience necessary as we will train you. We have a place for everyone too. It doesn’t matter how much or little time you have to give, we have a place for you! Please visit www.cfsimissing.com for more information! on August 6, 2012 at 6:17 pm | Reply Order in the Quart! It’s always a blessing to find a kindred spirit. I am a momma of three kiddos, one dog, and a bunny. Keep that flame for Christ a-glow. These last days was a facing a wind of darkness that would like to snuff out our flame. I get wildly frustrated that the church is losing it’s sight in the balance of love and truth. One without the other results in either sugar-coated apostasy or legalistic hypocrisy. “Let us love in action AND truth…” 1John 3:18 God bless you, sister in Christ…. Yes, it’s always a blessing to find a kindred spirit in this big ole world we live in these days. I know exactly what you mean regarding the frustration felt in large doses, almost overdoses at times, when it comes to the church and where it’s going. We must keep His truth in the front of our lives, while we continue doing our very best to love everyone; and maybe most of all – loving those it’s the hardest for us to love. I saw you doing just that in a reply to a post that I read just today. You continued to act in a respectful and loving way when I’m sure it was anything but easy. I think the good Lord smiles a little at us when He witnesses those actions too 🙂 Doesn’t love matter the most when it’s the hardest to do? One of my (many!!!) favorite verses is Ephesians 2:10 (NLT) We are God’s masterpiece. He has created us anew in Christ Jesus, so we can do the good things he planned for us long ago. There’s just something so special to me about being referred to as “God’s masterpiece”. I mean…… Wow. Masterpieces are priceless! Me? Really? And you, my new friend, Patty…. you too are one of God’s masterpieces! Considering what a mess I feel like, am like, half the time… I’d say being a masterpiece is pretty awesome! It’s incredible that while we’re still so broken, He sees us this way. He’s indeed changing us, starting on the inside and working His way through us, holding our hands and lifting our heads as necessary. We are all blessed. As for the dogs…. Maybe He knew that some days we’d need a gentle lick and something warm to snuggle with??? My favorite breed is the Great Dane and I have two of them, second favorite breed is the Australian Shepherd and I have one of them. Then there’s the two Border Collie mixes, and a Min Pin/Yorkie mix. Yes, we are currently parents to six dogs and yes, they all live inside, and yes my house is quite full of dog hair (cat hair too with three of those, plus a bunny), and no…. I wouldn’t want it any other way! You left a comment on my blog, I thought I should look at your as well. I find it heart warming to find another believer slogging through the trenches of life, following as best as able the steps and commandments of Jesus. I like that ‘gently speaking’ part. I’m still working on it. I’m getting better – at least I don’t begin too many responses with “Okay, fathead, since you brought it up…” or “Arm Phaser banks” anymore. But I could probably be gentler yet. I’m looking forward to your comments on life. May the Almighty Creator God be with you in all things. Ha ha! I love that – “Okay, fathead, since you brought it up…” !!! Trust me… I do a lot of tongue biting myself at times. When I was trying to come up with a name for this blog, something that would let readers know right off, how it is that I’m reaching out to them…. the name Gently Speaking just sorta popped into my head and I knew right away that it was the right one. See, it helps to remind ME to be ever aware that Jesus didn’t go around and hit people with a frying pan to teach them. Yes, He was quite capable of anger and didn’t mind showing righteous anger when it was necessary, but most of the time He chose to speak ever so gently and with great love. So, my blog title isn’t a reflection of who I currently am, but more like who I’d like to one day be… someone who can and does speak gently. Thank you so much, Old Man Montgomery, for visiting my blog and mostly for caring enough to comment. By the way, I happen to love your “name” too! It was wonderful to discover that you are now following my blog, thank you! I see you follow Sebastian, one of my favorites, who’s sermons I just love to read as well! I look forward to readin gmore of yours in the future too. Hi Ellie! It’s so great to “meet you”! Please excuse all the changes I’m currently making on this blog. I just up and decided this morning that it was time to change my theme and am now trying to pick out the layout of all the widgets n such. Every now and again we just need to shake things up some!